10358 ft (3158 m) . 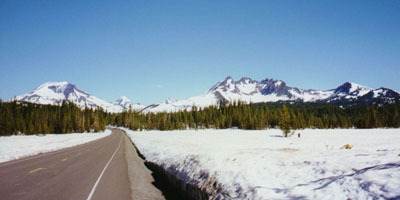 The volcanic peaks of the Three Sisters Wilderness dominate the landscape of central Oregon, visible from the Willamette Valley to the west and far across the high desert to the east. 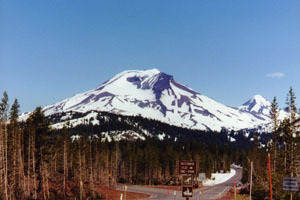 The Three Sisters are the highest and most prominent of the dozens of volcanoes which dot the Cascade Range between Mount Jefferson in northern Oregon and Mount Shasta in California, with each of the Sisters reaching the lofty 10,000-foot (3000 m) mark. 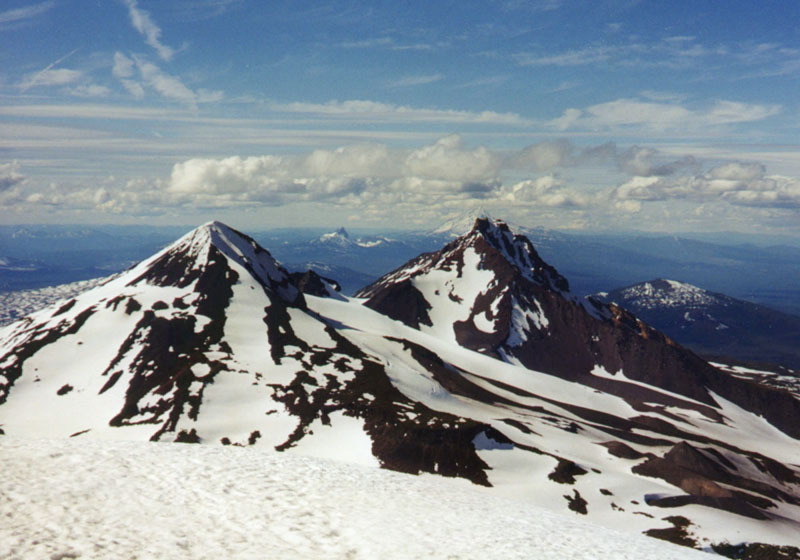 The Three Sisters group is quite compact, as the summits of North, Middle, and South Sisters span a total distance of less than 5 miles (8 km), yet the peaks host over 15 glaciers including the largest in Oregon (by area), the Collier Glacier. 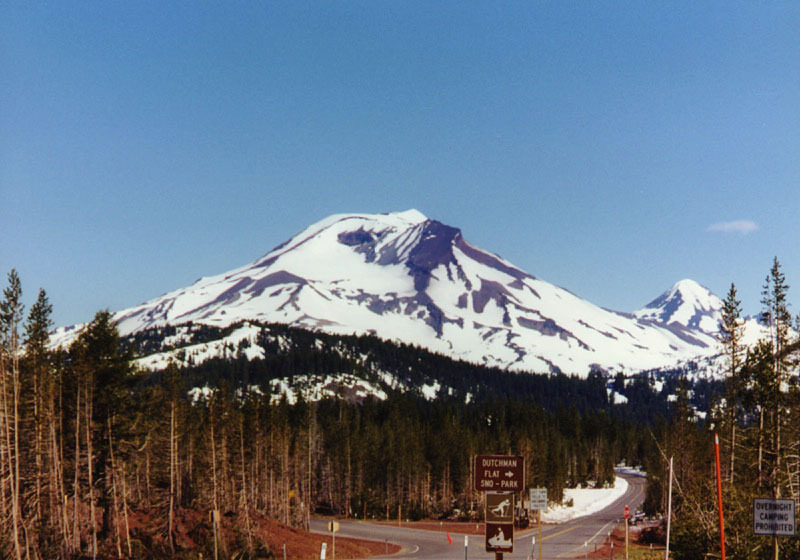 The variety of volcanic features in the area is astounding, including the extensive lava fields and cinder cones reaching from North Sister to McKenzie Pass and the numerous obsidian flows along the south flanks of South Sister. The youngest, tallest, least eroded, and most climbed of the three peaks is South Sister, which offers several fine possibilities for summit ski ascents and descents, including the classic and popular South Ridge route. Superb summit ski descents can also be found on the north or southeast ridges of Middle Sister, which forms a perfect cone on its western half, but is missing its entire eastern half where glaciers have carved out a massive cirque. North Sister is the most eroded of the group, with the original conical surface now vanished and with a ridge of unstable (and unskiable) congealed magma pinnacles forming the true summit. However, a number of routes on North Sister are skiable from just below the rocky summit area. In addition, it is possible to make a grand traverse of the entire Sisters group, known as a Three Sisters Marathon, and the neighboring peaks of Broken Top and Mount Bachelor can also be included if three volcanoes isn't enough. Unfortunately, access to the group is very long in winter and early spring, since all roads which lead to the wilderness region are closed by the heavy snowfall. By late spring, day trips into the heart of the region become feasible as trailheads on several sides are plowed out. North Sister Ski Mountaineering Routes: NOTE: All ratings are for ski routes only up to the base of the summit pinnacle. Full page description and photos of South Sister South Ridge route.